The Perfect Place for Lunch…AT DOMO! Spring is just around the corner and weather permitting our garden seating is already open for lunch!. Come down and join us for a fabulous lunch in a fabulous setting…AT DOMO! I would like thank our Domo customers for all of your support in 2008 and offer my Best Wishes for a very Happy New Year in 2009! Domo Japanese Country Foods Restaurant first opened its doors at this location in October 1996, and with your support, Domo has gained in notoriety and popularity ever since. For this opportunity, we thank you. When the new facility for Nippon Kan Culture Center was first built, the space currently occupied by Domo Restaurant was intended to be a classroom where we could offer classes in Japanese cooking. We discovered however that commercial kitchen equipment was required even for cooking classes so we decided that with that kind of investment we would have to open as a restaurant instead. On the day Domo opened, the menus were not finished, and the staff of four barely had time to change out of their construction clothes and into restaurant attire before the doors opened. I was the one and only chef, and the dishwasher was the chief carpenter responsible for the building remodel. The reception was manned by Don who had also spent months helping in the construction efforts and Emily who was serving as the Nippon Kan new facility coordinator. About one month later, a food critic from Channel 4 came to Domo for dinner and reported his experiences on the evening news. From that day forward, Domo has grown steadily and has expanded its seating both inside and outside exponentially. Today Domo has a staff of about 25 and has served many thousands of guests in the last thirteen years. Customers from around the world have been delighted with Domo’s rustic, traditional Japanese interiors and garden décor which except for basic mechanical installations, was built entirely by our crew and an army of Nippon Kan volunteers. Please visit the web site to read Gaku Homma's entire letter. Go to the web site to see the list of winners! No time tonight to dine out at Domo? Then dine IN with Domo’ s NEW Express take-out menu for lunch and dinner! Domo Restaurant now features our Domo Express Take-Out Menu for lunch and dinner. All entrees include three of Domo’s famous country side dishes, miso soup and brown or white rice with barley. Order by phone or come in to order a delicious Domo meal to go! Domo Express Take Out is available during regular business hours Monday through Saturday. Domo Restaurant is housed in Nippon Kan Culture Center, a 501 © 3 Federal non-profit organization first established in 1978 and plays an important role in the overall cultural and humanitarian purposes of the center. Currently Nippon Kan’s local and international cultural and humanitarian efforts are conducted through AHAN (The Aikido Humanitarian Active Network). Nippon Kan AHAN supports projects world-wide and Domo is a primary sponsor for all AHAN activities. Two of our many projects include supplying one ton of rice per month for two orphanages in Bangladesh and locally, eighteen years of consecutive service and 50,000 meals served to the homeless at the Denver Rescue Mission..
More information on all of AHAN’s many project in other countries like Nepal, the Philippines, East Timor, Mongolia, Guatemala, Mexico, Turkey, and more can be found on the Nippon Kan website at www.nippon-kan.org. Proceeds from every meal served at Domo are used to help fund these many projects world-wide. I hope that this year too, our customers and friends at Domo will continue to support our efforts with your patronage. A wonderful way to introduce your kids to traditional Japanese culture and cuisine with Nippon Kan’s Children’s Cultural School Field Trip program. Ask your teachers about signing up for a fieldtrip this spring! Domo’s customer service questionnaire is now on-line! Customer comments are now welcome online on the Domo website. Enter to win and let us know how your experience was at Domo. 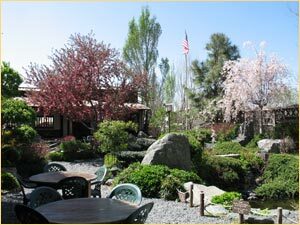 This year Domo Restaurant has been named in Zagat’s National Restaurant Review’s America’s Top Restaurants 2009!